Because this news is coming in so rapidly from eyewitnesses, these stats are only approximations, and may be revised. If you know of any additional information to add, please send email. "We have a great vision before us: a fully democratic hemisphere bound by goodwill... the benefits of dignity and freedom"
"cruel, inhuman and degrading treatment"
APR-25-01 01:55PM EDT - From Quebec Legal: 30 activists still in jail, total arrests reported at 463. Intelligence personnel with american accents reportedly questioned jailed activists during the night. The United Nations expressed its continued concern at "the extensive occurrence of detention, long-term detention, extra judicial killings, persecution and harassment, threats, acts of violence, and discrimination directed against persons who exercised the right to freedom of opinion and expression; called for further progress towards the release of persons detained for exercising the right; and expressed its concern at the number of cases which were facilitated and aggravated by such factors as abuses of states of emergency , exercise of powers specific to states of emergency without formal declaration and too vague a definition of offenses against State security" during the 57th session of the Commission on Human Rights, April 23rd 2001. Amnesty International condemns the excessive use of force and violation of human rights in Quebec City during the Summit meetings. 2:27pm EST April 23. Activist and lawyers held a press conference in front of Prison d`Orsainville at 1:00pm today, as hundreds remain incarcerated. Human rights abuses inside the prison have been reported, including: denial of access to bathrooms, 4 people crammed into single occupancy cells, indiscriminate strip searches, and constant use of intimidation tactics. 50 demonstrators maintain solidarity outside the jail. 12:01am EST April 23 At least 50 protestors continue to hold the vigil outside the Quebec City prison, where 200-350 people remain in custody. No arrests yet of those demonstrating outside the prison. 9:00pm A22 - OQP (Operation Printemps Quebec) has received a report from outside the Orsain Vaille prison that the police are preparing to arrest those demonstrating outside the prison. There are approximately 70 demonstrators outside the prison demanding the release of imprisoned demonstrators. Local residents and police demand more democracy and condemn the excessive use of force this weekend. Police have announced that they will arrest anybody caught in the streets with a gas mask. Witnesses state that many police have covered their identification tags and badges. A radio journalist, known as "Sebastain" is now missing from the Center for Media Alternatives in Quebec (CMAQ) who was on the scene reporting live to alternative media. The journalist was on cell phone giving a report when he started screaming to be let go. His phone dropped to the ground and communication was lost. Tonight a corporate media blackout is in effect and are not reporting the events in the street. Our Prime Minister is unaware of what workers, unions, and protesters are experiencing right now in the streets. CNN, CTV, CBC all play a half dozen various video clips which do not provide live accurate reporting. The police are only being held accountable by the independent media and eye witness accounts. Protesters report that they have not seen anyone from the authorized media out on the street tonight. Journalists and videographers from the nonprofit or independent media are being arrested . Members of the corporate media who leave authorized areas are being arrested. Riot police are shooting rubber bullets at anyone attempting to get into CMAQ. Police seem to be losing control of the situation, they are under orders to clear the streets. They have escalated the violence. There is indiscriminate and excessive use of stun-guns, rubber bullets and CS gas. Martial law has been enacted but has not been formally announced. Citizens in Quebec City are being arbitrarily arrested if walking calmly through the streets. Lawyers are not being permitted to talk with their clients. Legal observers are attempting to meet with police to discuss this direct violation of Canadian law. Conditions in the jails, according to frequent reports, are "deplorable." Men are being washed naked and hosed down with cold water in a courtyard in groups. They are being deprived of food, water or access to the bathroom. They were held in buses for as long as seven hours , breathing the residue of tear gas on their clothing the entire time, before being moved to the prison. The Quebec Legal Team has confirmed reports that protestors are being detained on buses at the prison and not being given water, food or access to bathrooms or a telephone call. According to reports, tear gas canisters were going off near the buses as those arrested were boarding. The legal team says this is a clear infringement of civil rights because those arrested are entitled to three meals a day and personal dignity. Riot police are now using concussion grenades against the protesters. The police have shut down the Quebec Medical team's space and wounded protestors are now being attended at the Independent Media Center (CAM). People were forced out of the medical center at gunpoint earlier this evening. There are a few safe havens where injuries can be treated. Police raided an alley in front of the medical center where people were being treated. The police drew their guns on medics and patients and forced them out onto the streets, the medic said. Medics have been targeted by police throughout the protests. The medic said police have been shooting tear gas and concussion grenades at medics as they try to help people. "This is not democracy", states MP Svend Robinson while on the front lines of the protest. (Realvideo: 660k - 1:06 min) Police eventually shot him in the leg with a plastic bullet Saturday as he lead a group of peaceful protesters away from police, who ordered them to move. The MP said he needed medical treatment for bleeding after the rubber bullet tore a hole in his pants. But in a more serious case, he added, an unidentified woman in critical condition needed surgery after she was hit in the throat by a rubber bullet. Police brutality against peaceful protestors not shown in corporate media. Independent media document evidence. Over 38,000 March in Quebec City, more than 200 arrests happened during the people's march. Almost 5000 march near Vancouver to the Peace Arch border crossing into Blaine, WA. Washington, DC: hundreds celebrate the fall of the Quebec Wall in in front of the U.S. Chamber of Commerce building. 3000 people at the western end of the international border fence between Mexico and the US at the San Diego/Tijuana border. All protesters going to Playas de Tijuana festival are forced to leave signs at border.A21 10:30pm 300 people from both sides of the border joined together to listen and dance to poetry and music. The Food Not Bombs activist organization provided free vegan food to all. One participant described the event as "beautiful". Brazillian military police violently repress and disperse 1500 peaceful protesting against FTAA within two hours. There were 100 injuries in the protest including nearly 30 activists hospitalized. The majority of those present were young students and activists. Among them were also journalists, a few lawyers and 'legal observers', present to ensure that rights of protestors were maintained. Over 60 people are now detained and remain in two police stations without legal representation. San Diego @ 4:10pm 1000 protesters marched. Several thousand march down Government Street to the British Columbia Legislature, Victoria BC Canada, April 21, 2001 to protest peacefully the FTAA. In Detroit approximately 500 people marchers from various organizations protest. About 100 attempted to block border traffic from Detroit to Windsor. 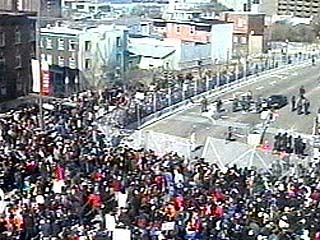 Atlanta 4/21/01: 150 protesters marched in downtown atlanta. CNN was one of their corporate targets, part of the FTAA solidarity actions. 200 demonstrators in Columbia stage completely non-violent civil desobedient protest against FTAA. April 21, Philadelphia: 150 Protestors against FTAA at City Hall. Hundreds gathered on Saturday near the Hendrickson Spring plant at 48th and Western in Chicago, IL to protest the Free Trade Area of the Americas. Plattsburgh, NY: 75 community members march through the streets in peacful protest. Halifax had a sucessful protest of 1000. 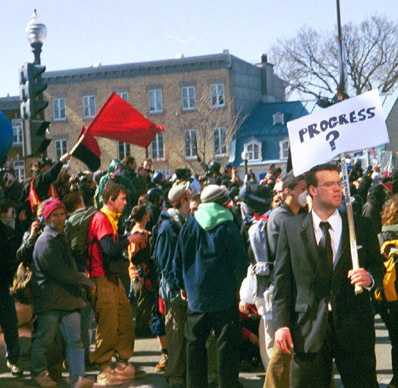 April 21, 2001: Students march in London, Ontario in protest against the FTAA. It took Place at the Covent Garden Market. The arrest of Jaggi Singh. Naomi Klein reports in the Globe and Mail (April 21) that only minutes after she had been speaking to him on the phone, Jaggi Singh was surrounded by three policy/security force members dressed as activist, shoved to the ground and kicked, thrown in an unmarked van, and driven away. When his friends tried to liberate him, they were fought off with batons. Who is Jaggi Singh? Why was he arrested? Has Canada become the 51st state? Why did over 40 thousand protest in Quebec? The future of Canada is in crisis. Is there a better way? Non-leathal weapons are used to "control" crowds. More accurately, they are used to inflict unbearable pain. Tyrannical governments have always used torture to during interrogation or to silence dissidents. Somehow we imagined this could never happen in Canada. The use of CS 'tear' gas bombs, water cannons, stun guns, concussion grenades, and plastic bullets in Quebec city this weekend are all methods for mass infliction of pain upon dissidents. This weekend there were mostly peaceful protestors, many of whom were attacked by security forces with these weapons. Is this an "acceptable use force" in the minds of the Canadian citizens? The picture on the far right is a plastic bullet which was frequently used last weekend by police to attack protesters against the FTAA. It caused substantial injuries even to people who were sitting calmly in quiet protest. 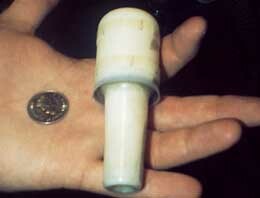 The plastic bullets are much harder than rubber, and cannot be broken by a hammer. People were shot in the head, kidneys and spine. Some at point blank, and some while the victim was lying down unconscious. Why has popular media shown the 2% of protestors who were violent and no scenes of police brutality? "What I've seen here is a criminal police force in my opinion. This was some of the worst brutality i've seen in my life. Full military grade C.S. 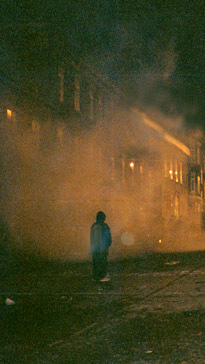 gas was used against demonstrators. I also treated a man who was shot in the spine 3 times with plastic bullets: the last one fired after he lay unconscious. Tear gas canisters hit women and caused 1st and 2nd degree burns on their face." "It's not the violence that may or may not happen in Quebec City this weekend that is the real subject of concern in this context. It's the violence that has underwritten various forms of globalization in different parts of the world: driving people off their land, destroying their livelihood, with its effects on individuals, families and communities." 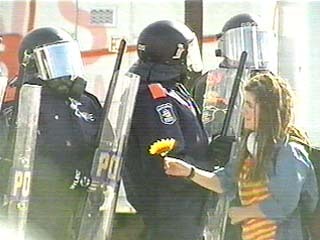 "The federal and provincial governments are to blame for the mistreatment because the police were acting under their orders.These are operations that remind me of what I saw in Latin America, in Guatemala, or Chile under (former president Augusto) Pinochet .People are being taken away; we're not yet at the stage where people are being made to disappear permanently." "My overall impression of Quebec has been less the need to destroy and more the desire to be heard. The streets were filled with sound, every available surface used as a percussive instrument creating a steady drumming that pervaded the entire city. Woven into this cacophony was the lone sound of a bagpipe played by a protester in full Scotish regalia. Chants filled the air in more languages than I could decipher and protesters sat in front of oblivious police lines trying to explain to them what the FTAA was all about. " Email the Prime Minister of Canada at pm@pm.gc.ca, use the feed back form. Video footage and photos courtesy of Toronto Video Activist Collective and IMC. Please inform us if your links or media are not public domain or considered "fair use" by law, and they will be removed.